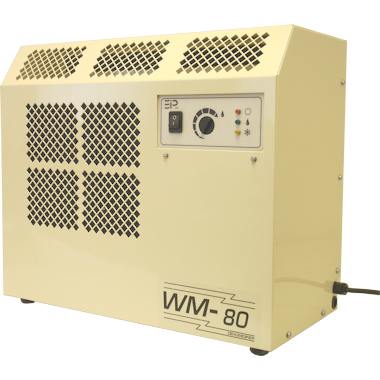 The EIPL CD85 commercial / industrial dehumidifier has been designed to provide energy efficient humidity control in a wide range of applications including offices, laboratories, apartments, storage areas, restaurants, bars, museums, locker rooms, computer, telecommunication rooms, basements and crawl spaces. It is a quiet, high efficiency, high capacity unit designed to suit your HVAC needs. The configurable inlet and outlet positions ensures flexibility for all applications. The EIPL CD85 dehumidifier is a stand alone solution to your humidity problem. The unit is supplied with a pre-wired, remote humidistat, extra long power cord and long condensate tube. This preassembly makes the installation process simplistic, thereby reducing the overall installation and project cost. The high efficiency Rotary compressor ensures the maximum extraction with the lowest running costs. Rubber Anti vibration feet ensure any running / operation noise is kept to a minimum. Excess humidity in your crawl space, warehouse, office, factory or shop results in corrosion, mold growth and rotting. Enormous costs are incurred every year through damage to inventory and through inflated building maintenance costs as a result of dampness. Even if your building seems dry during the day, at night when the temperature falls the humidity rises and the condensation process begins. The compact physical size and high performance, makes the CD85 is the ideal choice for areas which require humidity control.